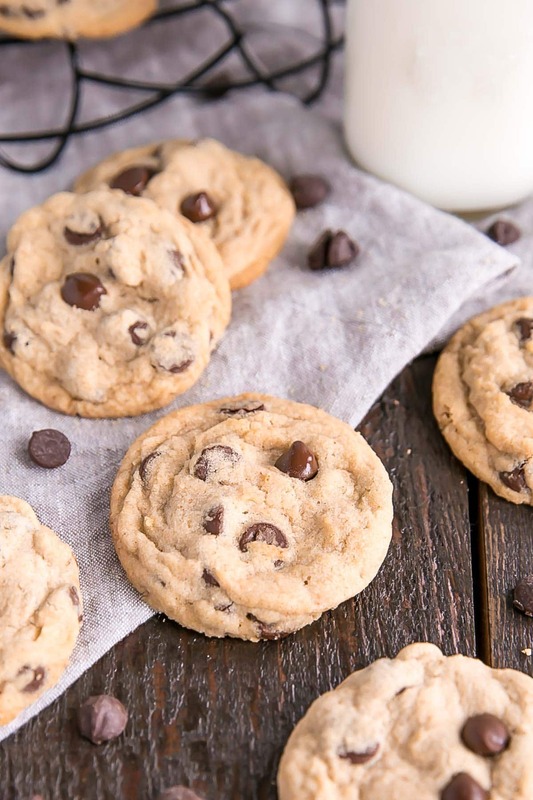 Enhance classic chocolate chip cookies with the nutty flavour of brown butter! 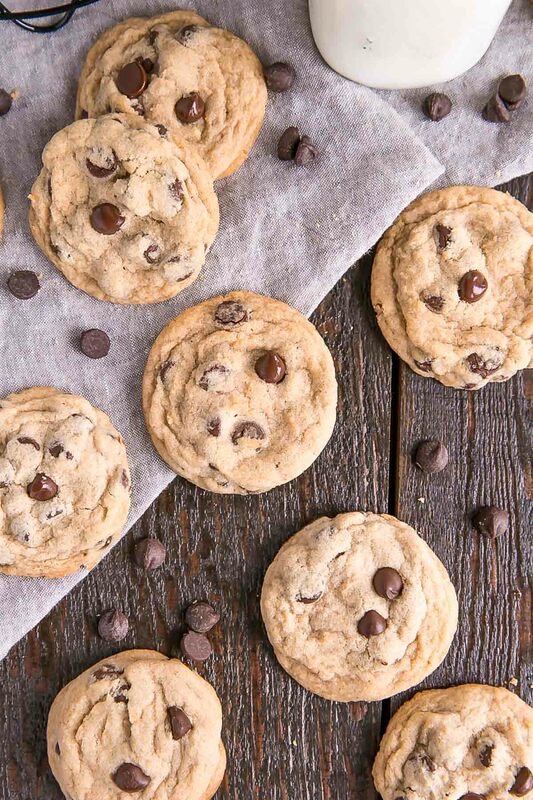 Soft & chewy, sweet & salty — these brown butter chocolate chip cookies will be a new favourite! I know, I know, you’re probably thinking to yourself: Does the world really need another chocolate chip cookie recipe? 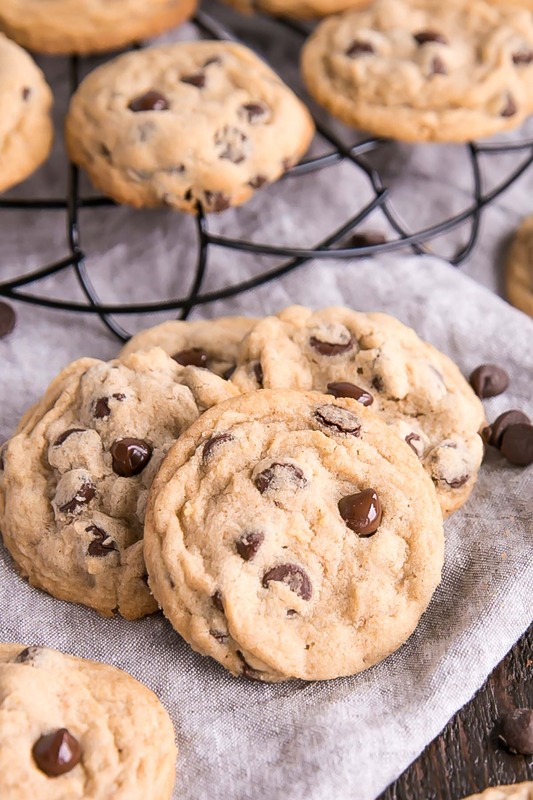 These are not just your typical, plain old chocolate chip cookies though — there are two not-so-secret ingredients that will make these the BEST chocolate chip cookies you’ve ever had. The first key ingredient, obviously, is brown butter. This is only my second time ever making/using brown butter, and I honestly don’t know why I don’t use it more often. 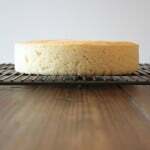 I first tried it for my Brown Butter Cake and was amazed at how much of a flavour impact such a simple change could have. You can read the details of what brown butter is and how to make it in that post, and if you haven’t tried it, I suggest you get on that asap! Brown butter has a wonderful nutty smell/flavour. It’s pure heaven. I had some left over from the batch I made for these cookies, and we used it in pancakes this weekend. SO good. I’m trying to come up with other ways to use it and omg I just thought: it would be AMA-zing on pasta. The second key ingredient that makes a huge difference is sea salt. Plain old salt will just not do. You need to get your hands on some flakey and delicious sea salt. There is nothing quite like that contrast of sweet and salty that totally makes your mouth water. Have I sold you on these Brown Butter Chocolate Chip Cookies yet?? I hope so. Now typically with my cookies, I chill the cookie dough and have indicated so in the recipe. This time though, I was a little impatient, so I just baked them right up. They turned out perfectly fine, so it’s totally up to you if you decide to chill or not! Chilling the cookie dough is usually very important, as it helps prevent the cookies from spreading too much and becoming flat and dry. I loaded these with chocolate chips though, so they really couldn’t spread that much!! You could always bake up a test batch of a couple cookies un-chilled and see how it goes. 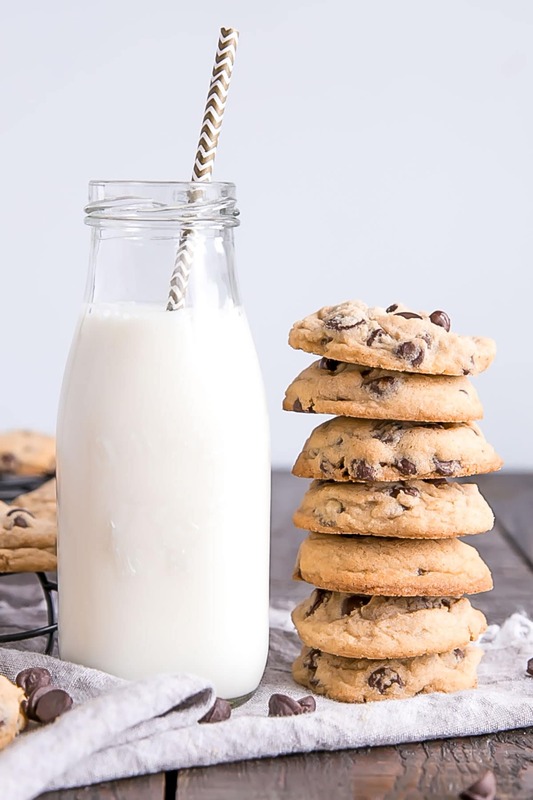 If you have a die hard chocolate chip cookie fan in your life (or are one yourself), I hope that you give these Brown Butter Chocolate Chip Cookies a try! Using sea salt over regular old salt is a game changer! This is the one I love and use. I’ve added dough chilling time into the recipe because I usually chill. I didn’t this time, so it’s totally optional. I used semi-sweet chocolate chips, but these would be equally delicious with dark chocolate chips or even chunks of chocolate. I used a medium cookie scoop (1 1/2 Tbsp) for these but you could use a large one (3 Tbsp) instead for bigger cookies. Baking time will need to be adjusted though. 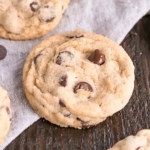 Enhance classic chocolate chip cookies with the nutty flavour of brown butter! 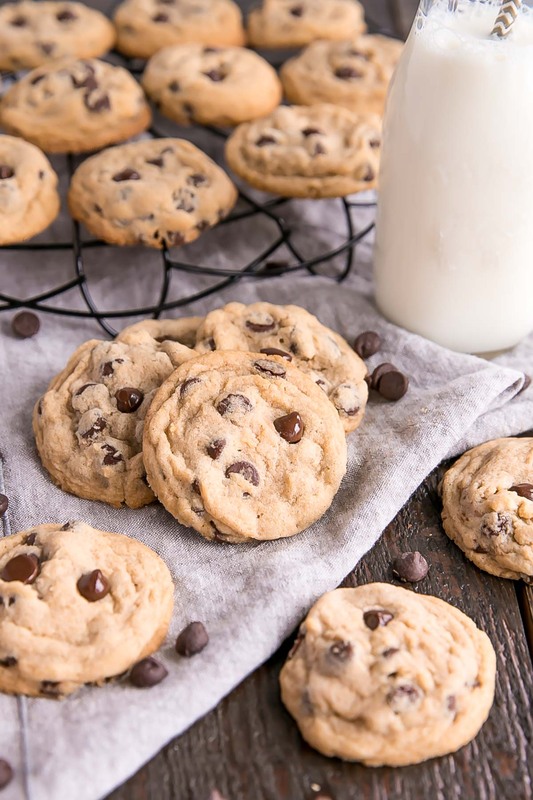 Soft & chewy, sweet & salty -- these brown butter chocolate chip cookies will be a new favourite! Remove from heat, stir, and pour into a measuring cup to measure out 1 cup. ** Be sure to get the the brown bits in there! Whisk together flour, baking soda, and sea salt. Set aside. Beat brown butter and sugars on medium speed until light and fluffy (approx. 2-3mins). Reduce speed and add eggs (one at a time), and vanilla. Beat until combined. Add in the chocolate chips (I toss these right into my mixer but it struggles a bit). If you're using a hand mixer I'd recommend folding them in with a spoon or spatula. Refrigerate cookie dough for at least 3 hours or overnight. Use a medium cookie scoop to portion cookies. * Be careful not to burn it. It will go from brown to black very quickly. ** Any extra can be used as a sauce for meat or vegetables. *** Once the butter is at room temperature, you can place it in the fridge to speed up the solidifying process. Be sure to bring it to room temperature before using in the cookies. NOTE: Prep time does not include time to make and cool brown butter, but does include cookie dough chilling time. Hi Nina! Do you have an oven thermometer? Maybe your oven runs on the cooler side? I tried cutting the recipe in half, but the final turned out runny, Not sure if the batter is supposed to be runny, but i dont think so. 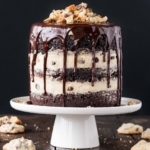 is there tips for making half recipe? Hi Christine! It should not be runny at all. Was the butter solid? The recipe should cut it half just fine. You can adjust the Servings slider to the amount you want. Super Yummy Cookies! I did chill the cookies before baking, it does make a difference. Normally on any given Friday night, I bake a batch of cookies. This time since we had snow outside, we took our time baking. I did not use sea salt, it is too salty in our food and baking. I use the good ol table salt. That was just right for our taste. I have yet to venture in the way of Sea Salt into baking. This recipe was as good as it looks the chips to dough ratio was just right, too. 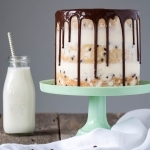 It is one of the better chocolate chip cookie recipes. I’m having a little trouble understanding your recipe. Under ingredients, you list brown butter 1 cup, but under brown butter chocolate chip cookies, you list 1 1/2 cup brown butter. Which is correct, 1 cup butter or 1 1/2 cup butter? I can’t figure out what to do with the 1/2 cup of left over brown butter. Hi Johnnie! You start with 1 1/2 cups regular butter to make the brown butter as some of it will evaporate. Once you have the butter browned, measure out 1 cup for the cookies. Any extra can be used as a sauce or on toast, etc. If baking these is the only thing I accomplish today, I will count it a productive day. 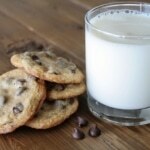 I’ve had a go-to, tried-and-true chocolate chip cookie recipe for over ten years. You just replaced it. Forget the fact that I could have eaten that brown butter plain off a spoon…these cookies are making me fail for words. So. Delicious. Oh wow, that is a HUGE compliment Liz, thank you so much! I’m so happy to hear that you liked these! 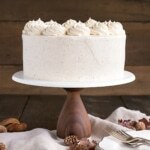 Your cookies, cakes and little tarts look fantastic, and the photography is delicious looking too. As soon as I saw your website I guessed that you were Canadian and sure enough you were! I have made the regular old perfect chocolate chip cookies – now to kick it up a notch with the browned butter! Do you think I could begin to make the cookies when the butter is at room temp but still liquid? 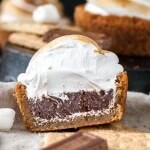 I’m trying to make these quickly and was wondering if it would have a major effect on the cookies. Hi Olivia! You’ll definitely need to chill the dough if you do that otherwise they will be flat like pancakes when you bake them! (1) I have a browned butter extract I got from one of those multi flavour packs from Michaels. Is there a way to substitute or use the extract instead of making it yourself? Hi Lauren! I haven’t had success with flavoured extracts. 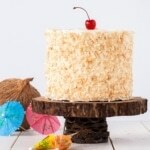 My very first cake I used a butter flavoured extract in the frosting and it tasted like microwave popcorn – horrible!! If you want to try though, just use regular unsalted butter in the recipe and 1 tsp of the extract. Ok, yes, you have my attention with the brown butter. It sounds amazing and I wish I had thought to use it more, too. Can’t wait to try! 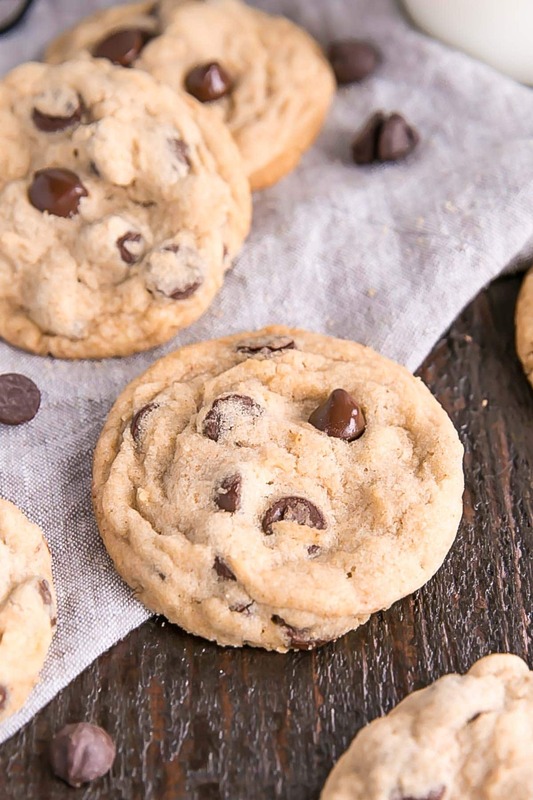 Plus who can say no to “another” chocolate chip cookie recipe, never! Lol thanks Cindy! Brown butter is such a game changer! 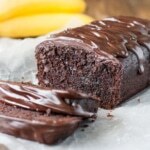 Hi Olivia — these look delicious! Do you have any suggestions for any adjustments that would need to be made to this recipe for folks at high altitude (around 5,000 ft)? Thanks!